It has been over a century since Ford was founded, and, throughout the years, they’ve created innovative, groundbreaking vehicles for America and the rest of the world. Although not all vehicles have been a commercial success, they have all helped shape the company into what it is today. 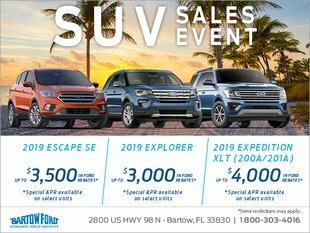 A few of these vehicles have been truly monumental, and Bartow Ford, your Ford Lakeland dealership of choice, would love to share a little bit about them. Let’s take a look at our Favorite Fords of the past that remain best sellers today. The Mustang was first introduced in April of 1964, although today we want to focus on the model released in 1982. At the time, power, muscle, and speed had waned in the hearts of the consumers. Those qualities were simply no longer addressed due to years of attrition, as most manufacturers placed less and less focus on them. The 1984 Mustang GT changed that. Known as the “5.0” engine, this Mustang had a 4.9L small-block engine with a two-barrel carburetor. At that time, this meant the GT was a top contender amongst muscle cars. Capable of outputting up to 157 horsepower, this vehicle was the catalyst towards the “Horsepower War” that manufacturers are still fighting today, and we’re so thankful for it. The F-Series today starts at the F-150, the entry-level consumer pickup, and can go as high as the F-750, a remarkably powerful commercial truck. Back in 1948, this wasn’t the case. It was in 1948 that Ford first introduced the F-Series with a half-ton truck. At the time, this pickup was a revolutionary vehicle, allowing more farmers to transport their goods and equipment around their property, helping to propel American industry. Today, the F-Series remains at the top. It has landed at the peak of sales charts for the past 40 years, signifying an undeniably successful run as the favorite truck of Americans across the country. For Bartow Ford, keeping the rich Ford history alive is a veritable pleasure. Our goal is to educate consumers about the value and consistency Ford Lakeland vehicles bring. We are excited about the future of Ford considering the track record that they’ve had. If you’re thinking about shopping for a Ford yourself, head over to our location on 2800 US HWY 98 North, open Monday through Friday or 24/7 online.